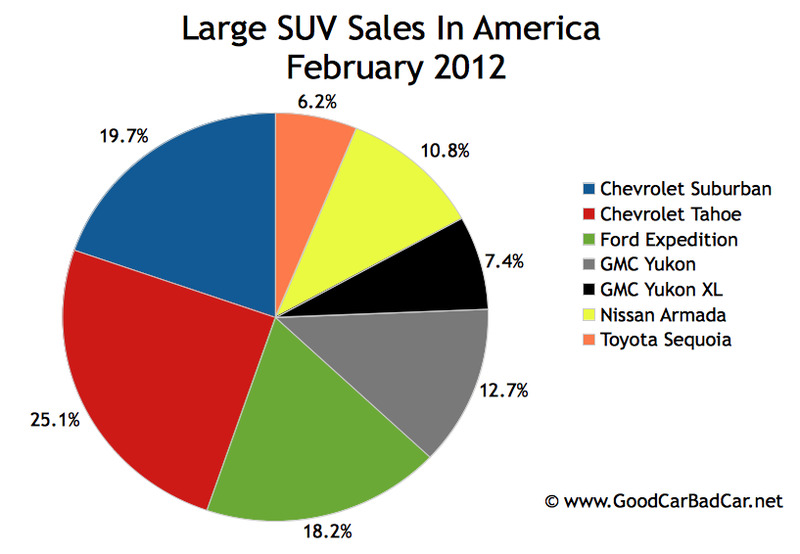 As a preface, remember that the U.S new vehicle market grew 16% from February 2011 to February 2012’s 1,15 million vehicles. The SUV story includes many gains greater than that, but many notable declines, as well. The Honda CR-V was America’s best-selling SUV in February. CR-V sales jumped 30% and are up 23% so far this year. Another Japanese manufacturer, Mazda, sold 2578 two-row utility vehicles in February. Three vehicles accomplished that feat. Mazda sold 2561 two-row crossovers in February of last year. In other words, the CX-5’s impact was small in February, and what impact there was only helped to steal sales from its brethren. Not a single Jeep reported year-over-year declines in February nor has a single Jeep reported a year-over-year decline through the first two months of this year. The greatest increase among smaller utilities compared with the same period of last year belonged to Mini. Countryman sales jumped 46%. YOY declines belonged to just seven vehicles in the first table below. Apart from the dying Mazda Tribute’s 44% drop, the worst loss was owned by the Kia Sportage. Sales of Kia’s smaller utility dropped 14%. 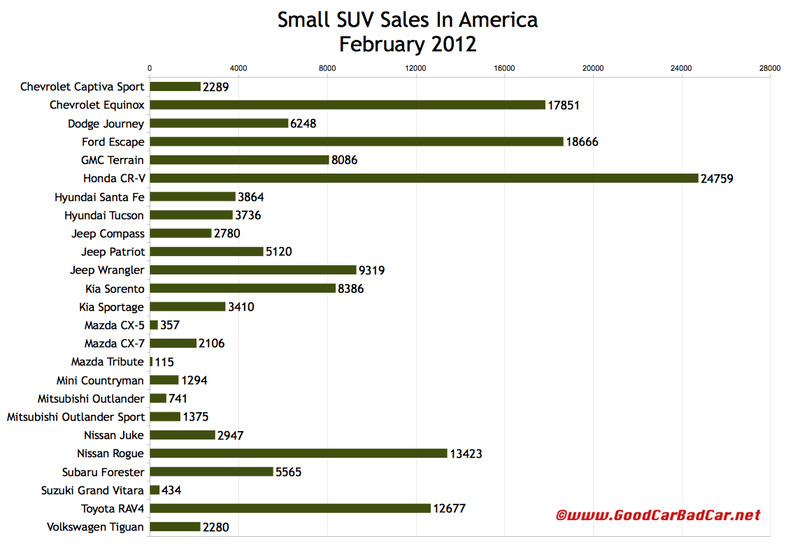 After the jump you’ll find specific sales numbers for every single mainstream SUV/CUV/crossover on sale in the United States. (Honda didn’t sell an Element in February.) Click any chart for a larger view. Use the dropdown menu at the top right of this page to find monthly and yearly sales data from the U.S. and Canada for any nameplate currently on sale. Lambda platform sales at General Motors plunged 16% in February. Remember, the market wasn’t level. Overall new vehicle sales were surging, yet sales of the Buick Enclave, Chevrolet Traverse, and GMC Acadia were particularly unhealthy. Mazda CX-9 sales dropped 29%. The Subaru Tribeca was down 21%. Toyota 4Runner sales slid 18%. Hyundai Veracruz sales slid 19%. On the positive side, America’s favourite midsize SUV (a loosely defined segment, it must be said) also managed to post the greatest year-over-year increase of any midsize SUV. Jeep Grand Cherokee sales shot up 47% from 8667 to 12,724. The Grand Cherokee’s lead over its arch nemesis, Ford’s Explorer, now stands at 3001 units through two months of 2012. Jumbo SUVs are sold around the world. In reality, the bulk of the market is in the U.S. And one can safely assume the bulk of the U.S. market for very large truck-based sport-utility vehicles is in Texas. Chevrolet Suburban sales shot up 39% in February 2012. The Suburban trailed only its little brother, the Chevy Tahoe, in terms of overall volume. So far this year, it appears almost as though many potential Tahoe buyers are skipping the smaller of the two large options and heading straight to the Suburban. 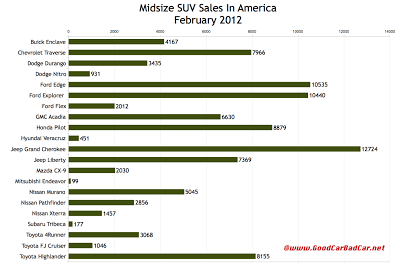 In February 2012, Chevrolet sold 7516 Tahoes and Suburbans. During the same period of last year, Chevrolet sold 7451. In the first two months of 2011, Chevrolet sold 15,075 Tahoes and Suburbans. One year later, Chevrolet sold 14,446, a very small difference. Though Tahoe numbers are way down, it doesn’t speak of bad things going on in Chevrolet showrooms. At least not the Chevy showrooms in Abilene and San Angelo.